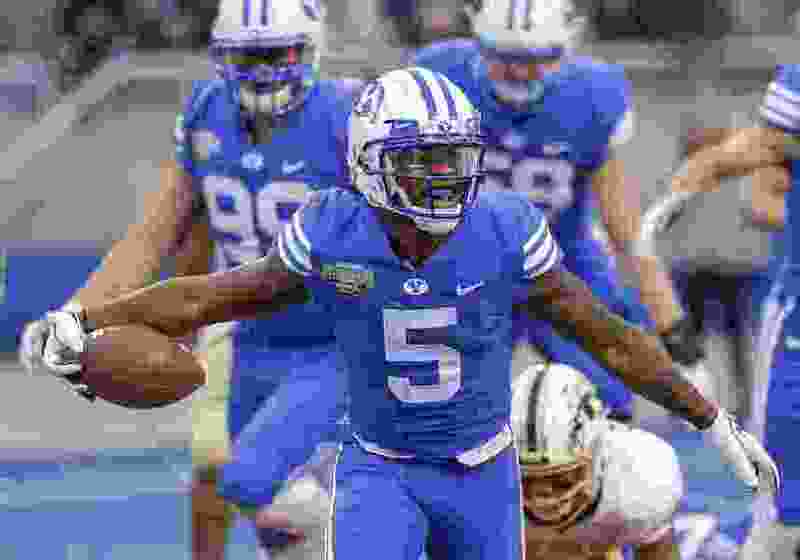 Provo • Touting a home slate that includes Utah, USC, Washington and Boise State as “one of the best home schedules in school history,” BYU released its 2019 football schedule on Wednesday. There are no surprises from what has been previously published by The Salt Lake Tribune and other news outlets. According to the school news release, BYU will be the only Football Bowl Subdivision team to start 2019 with four straight Power 5 opponents: Utah, Tennessee, USC and Washington. Utah and BYU will meet to open the season — on Thursday, Aug. 29 — for the first time in rivalry history and just 279 days after Utah defeated BYU 35-27 in the 2018 regular-season finale at Rice-Eccles Stadium. The Cougars, who went 7-6 last season, will travel to Knoxville, Tenn., for their first-ever matchup with the Tennessee Volunteers on Sept. 7 at Neyland Stadium. Tennessee went 5-7 last year, including 2-6 in the Southeastern Conference. Then it is back to LaVell Edwards Stadium for matchups with USC on Sept. 14 and Washington on Sept. 21. It will be USC’s second visit to Provo and third matchup between the Cougars and Trojans, who went 5-7 last season. Washington, which fell 28-23 to Ohio State in the Rose Bowl earlier this month, will return to LES for the first time since 2010 when the Cougars took a 23-17 victory. The Huskies pummeled the Cougars 35-7 last September in Seattle. In all, the 12-game BYU schedule includes four different trips to the Eastern time zone for games at Tennessee, Toledo (Sept. 28), South Florida (Oct. 12) and Massachusetts (Nov. 23). BYU is 1-0 against Toledo, 2-1 against UMass and has never played South Florida. The Cougars’ two other home games are against fellow independent Liberty on Nov. 9 and FCS Idaho State on Nov. 16. Liberty went 6-6 in its first FBS season and will be playing BYU for the first time. The Cougars will return the visit in 2022. BYU will travel to instate foe Utah State on Nov. 2 having lost two straight games to the Aggies. It will finish the regular season against former Western Athletic and Mountain West rival San Diego State on Nov. 30 at San Diego County Credit Union Stadium. The Aztecs went 7-6 last season, 4-4 in the Mountain West, and fell 27-0 to Ohio in the DXL Frisco Bowl. If the Cougars get six wins or more to become bowl-eligible, they will play in the 2019 Hawai’i Bowl in Oahu. Kickoff times and television broadcast plans for all 12 regular-season games will be announced at a later date.